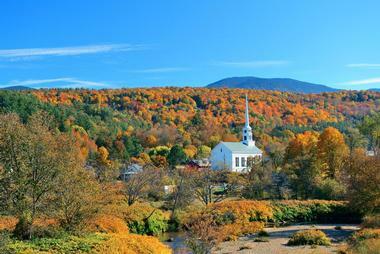 When you think of New England, Vermont's fall colors, winter sports, and summer festivals come to mind. Visit an alpaca farm or a fly-fishing museum, stay in a romantic inn, tour the former home of poet Robert Frost, or learn how to make maple syrup. 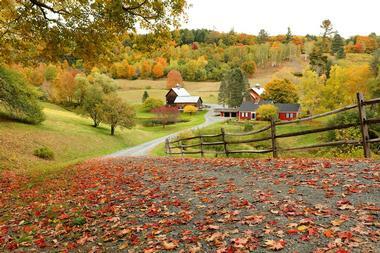 Vermont gives visitors an open-armed welcome year round. 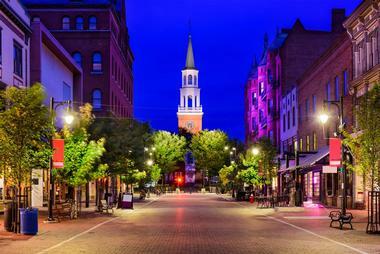 Here are the best places to visit in Vermont. The residents of Burlington are dedicated to environmental stewardship and it shows. 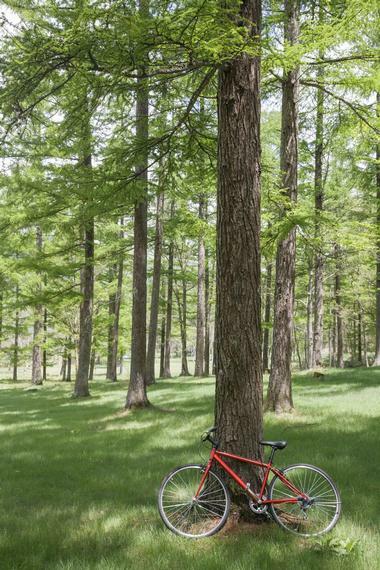 Like-minded visitors will enjoy biking the Greenway (also called the Waterfront Bike Path), a forested corridor that runs the entire length of the city. From here, there is access to over 30 miles of trails spreading across abundant natural areas via 127 paths. Stowe, Vermont’s winter playground, is a picturesque mountain retreat that looks like a scene from a Christmas card. Combined with the magnificence of Mount Mansfield, it’s easy to see why it’s been dubbed the ski capital of the East. Over 20 feet of annual snowfall allow visitors to ski and snowboard November through April. 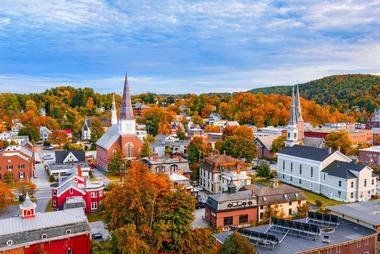 Montpelier, the capital of Vermont, has the distinction of being the smallest capital city in the country. 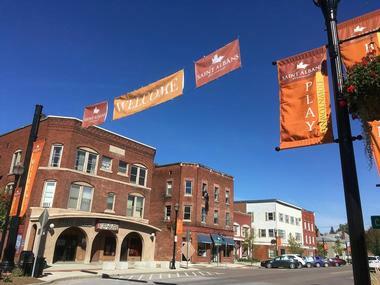 Located in the Green Mountains along the Winooski River, Montpelier’s historic downtown is filled with colorful boutiques and independently owned shops offering everything from chocolates to books to toys. Restaurants and bars come alive at night with eclectic cuisine and live music. Visitors will appreciate the gold-domed capitol, its art installations, and its outdoor event space. Local galleries, music venues, live theater performances, and a free summer concert series entertain visitors all year round. Nature lovers can stroll through Hubbard Park’s natural beauty and enjoy scenic views. 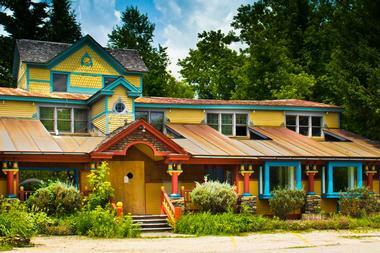 Woodstock is a quaint little mountain town that has elevated tourism to an art form. If you’re looking for the classic New England getaway, then this is it. There are dozens of cozy bed-and-breakfasts as well as luxury resort accommodations. Woodstock has a famous equestrian venue at the Green Mountain Horse Association, offering events and trail-rides. Other activities include biking, golfing, shooting, fishing, and visiting working farms. During winter, add downhill and cross-country skiing, sledding, skating, and snowshoeing. They have art and historical museums, as well as historic sites like the popular Marsh-Billings-Rockefeller National Historic Park, which offers tours of the grounds, mansion, and surrounding forest. Manchester is nestled in the Green Mountains, a world away from big city life. One of the best ways to experience an overview of the area is with Backroad Discovery Tours. These seasonal tours introduce visitors to Vermont specialties like an alpaca farm, maple shack, and a Norman Rockwell exhibit. Hildene – the former Lincoln family home, the Manchester Historical Society, and the American Museum of Fly Fishing are popular points of interest here. Hills Alive presents a calendar of fine and performance arts activities. In winter, go skiing at Bromely Ski Resort, ride a sleigh at Taylor Farm, or ice skate at Riley Rink. 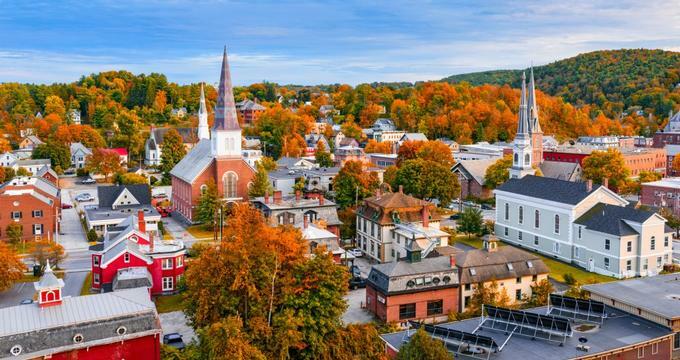 Bennington, Vermont, is the place to go if you want to get a taste of Americana. The covered bridges alone are worth the drive. After experiencing the bridges first hand, visitors can stop by the Vermont Covered Bridge Museum to learn about the legends, history, engineering, and builders of these historic structures. Bennington Museum is home to the largest collection of Grandma Moses art in New England as well as numerous Vermont historical objects. The Dollhouse and Toy Museum has vintage toys, dolls, puppets, and marionettes, among other treasures. The Robert Frost Stone House Museum, where the poet once lived, is a popular local attraction. 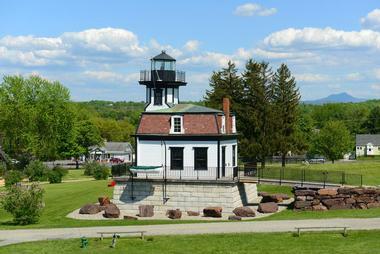 This small Vermont town offers summer fun at a family-friendly park along the shores of Lake Champlain. Kill Kare State Park has wide-open spaces, barbecue and picnic facilities, a small beach cove, and a ferry that provides easy access to both Burton Island State Park and Wood’s Island State Park. Cyclists will also like the 29-mile scenic Missisquoi Valley Rail Trail, which is a sandstone trail running through fields and forests and along the Missisquoi River. At the end of a day exploring nature, visitors can stop by 14th Star Brewing Company, St. Albans’s popular brew pub, which also serves food. 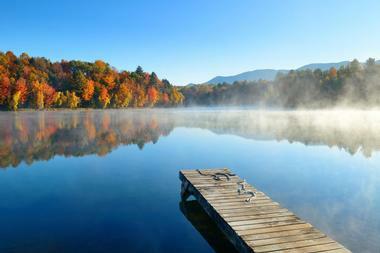 Colchester, Vermont, offers a diverse array of activities all year round. Visitors will enjoy the 27 miles of beautiful shoreline featuring scenic landscapes. 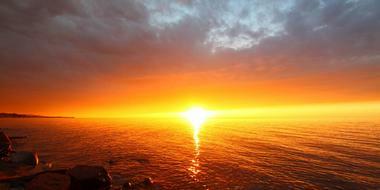 Lake Champlain provides a great space for various water activities like sailing, fishing, kayaking, and motor boating. The International Sailing School on Malletts Bay hosts races every summer and is a great way to spend an evening. The Green Mountains and the extensive 350-acre park system provide exceptional terrain for hiking, biking, skiing, snowmobiling, and other recreational activities. Visitors can admire the 4-mile Colchester Causeway Path, which extends out into Lake Champlain, or dive into the cultural scene at the Flynn Theater and St. Michael’s College Playhouse. Mount Mansfield State Forest is one of the most diverse forests in Vermont. This 44,000-acre forest envelops seven Vermont towns and the 880-acre Waterbury Reservoir, which provides visitors with fishing, boating, and camping opportunities. Mount Mansfield State Forest also contains the highest peak in the state – Mount Mansfield – and has two designated Natural Areas and a federally designated Scenic Byway. In addition, there are two alpine ski resorts, two Nordic ski resorts, miles of hiking trails, backcountry ski trails, and mountain biking trails. Visitors will find over 35 miles of trails for snowmobiling, plus opportunities for ice and rock climbing, and bouldering. The Bennington Battle Monument, the tallest statue in Vermont, commemorates an essential battle in the Revolutionary War. The Battle of Bennington was a pivotal turning point in the war. 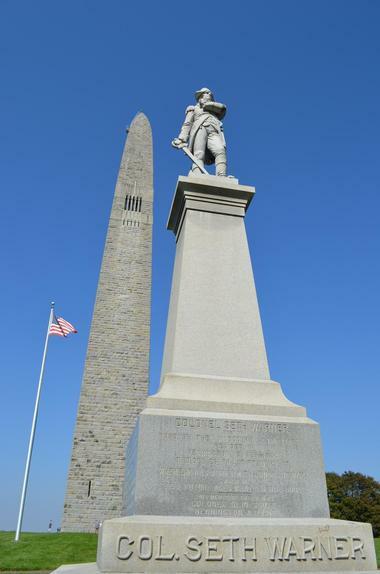 A smaller statue of General John Stark, the driving force behind the defeat of the highly trained British troops, stands next to the battle monument. The 306-foot-tall monument is made of blue-gray limestone and offers sweeping views of the scenic vistas of three states. Visitors can take an elevator to the top of the Bennington Battle Monument and enjoy panoramic views of Massachusetts, New York, and Vermont. 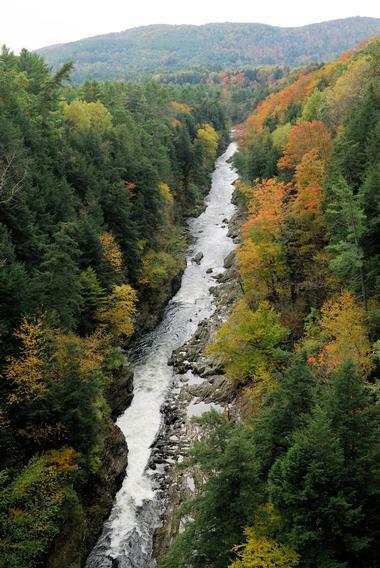 Quechee Gorge State Park is located along US Route 4 and provides visitors with awe-inspiring views of Quechee Gorge. It is the deepest gorge in the state and was created by glacial movement roughly 13,000 years ago. There are several viewing points along Route 4 offering picturesque views of the Ottauquechee River more than 160 feet below. 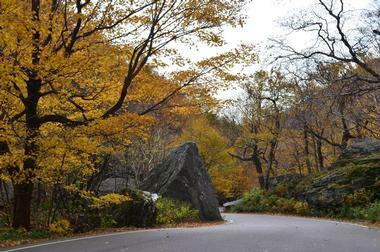 Those who enjoy hiking will find a trail along the gorge. A picnic area, campsite, and large playing field lie next to the trail. Guest can learn about the cultural and natural history of the park, including its woolen mill roots of 1869, from the park’s interpretive programs. 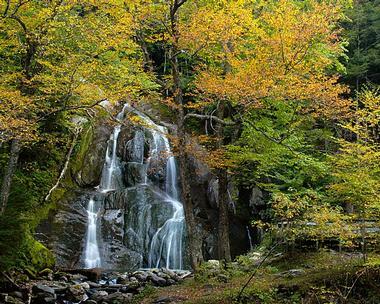 Smugglers Notch State Park is a slender trail winding through the Green Mountains between 1,000-foot cliffs. Its storied past began in the early 1800s, when President Jefferson banned U.S. trade with Canada and Great Britain. It was a struggle for locals to get to other markets, so many continued to trade illegally with Canada using this narrow pass. Later, it was a passageway for slaves heading to freedom in Canada, and still later it was used to smuggle liquor during the Prohibition. Today, visitors can learn about the area’s rich natural and cultural history while enjoying the various hands-on nature activities through the interpreter programs offered at the relocated park. Moss Green Falls at Stowe, Vermont, have a total drop of 125 feet and unique surroundings consisting of both meadow and mixed forest, with water cascading over the Stowe Schist Formation. The falls are broken up into varying fall depths along the way, beginning with a few small falls between 5 and 12 feet, then making a 33-foot drop into a small pool, followed by a plunge of 75 feet. The different cascading tiers can be seen while hiking up to the top of the falls. The cascades that fall into the gorge can only be seen if you have both repelling gear and the know-how to use it. Mt. Philo State Park was established in 1924 and is the oldest state park in Vermont. It stretches over 230 acres and overlooks the Adirondack Mountains in New York and Lake Champlain Valley. Visitors can camp or stay at Summit Lodge, located within the park. The picnic and camping areas provide stunning views of the mountains to the west and south, the lake, and the valley. There are various hiking trails that begin at the base of Mt. Philo and end at its summit and visitors can also sail, fish, or boat in Lake Champlain. Swimming opportunities can be found at nearby Button Bay or Kingsland Bay State Parks. 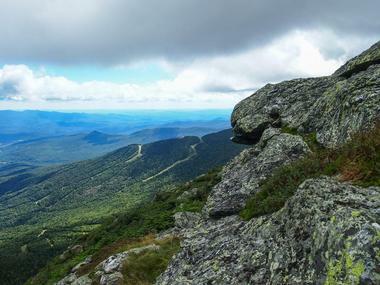 Camel’s Hump is an undeveloped state park of roughly 20,000 acres. The park itself is broken down in terms of elevation to establish preservation efforts. Between the summit and 2,500 feet in elevation, the park preserves wild habitats and rare plants. From 1,800 to 2,500 feet, the state strives to establish a protected ecological area that keeps its natural appearance and encourages wildlife. Visitors are allowed to snowmobile, Nordic ski, hike, and primitive camp in this area. Hikers who want a challenge can use the Monroe Trail on the Duxbury side, but for an easier trail, most hikers choose the Burrows Trail on the Huntington side. Jamaica State Park sits on more than 750 acres located half a mile from Jamaica, Vermont, along the West River. This river’s diversity draws both bait and fly fishermen who troll the slow water and wade the shallow ripples for the river’s abundant rainbow trout and smallmouth bass. Once a year, whitewater enthusiasts are also drawn here thanks to the water released from the Ball Mountain Dam. The park’s campground accommodates RV and tent camping, picnicking, and swimming at Salmon Hole. A picturesque hiking trail carves its way along the West River, branching towards Hamilton Falls. Family-fun activities are available at the nature center. Grand Isle State Park has a wide range of activities that draw the most visitors of any park in Vermont’s state park system. With over 225 acres and more than 4,000 feet of Lake Champlain shoreline, it draws in a plethora of campers each year. Visitors can rent kayaks, rowboats, and other water equipment as well as swim and shore-fish. There are various hiking trails, a volleyball court, a play area, and horseshoe pits. Visitors will also find park interpreter-led nature games, walks, and events. Other exciting activities nearby include visits to Chazy Reef, South Hero, Hacketts’ Orchard, and Snowfarm Vineyard. Emerald Lake State Park is located in Dorset, Vermont, and boasts an excellent swimming area and wooded hillside campground. The central feature of this 20-acre park is Emerald Lake, named for the color of its warm waters when viewed from the sky. Non-motorized vehicles are not permitted on the lake, making it the ideal place for canoeing, stand-up paddleboarding, kayaking, and swimming. Anglers can fish the lake for northern pike, yellow perch, and smallmouth bass. The park has excellent hiking opportunities, thanks to the Dorset Mountain Trails, Long Trail, and the Appalachian Trail. Interpreter activities, including various themed hikes, are also provided by the park staff. 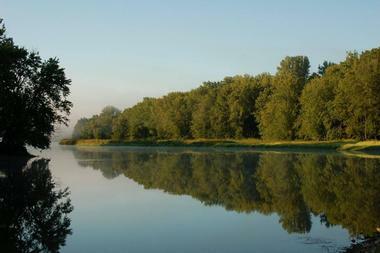 The Missisquoi National Wildlife Refuge offers a wide range of activities for visitors all year round. There are five refuge trails that cover 7.5 miles, perfect for viewing wildlife in both upland and wetland habitats. Several boardwalks along these trails allow for quiet reflection and elevated viewing opportunities for both resident and migratory species. Guests can access various habitats via kayaks, canoes, or small motorized boats on the Missisquoi River and Lake and on Dead Creek. Access to Jeep trails is also provided in late spring and summer. Fishing, hunting, and park interpreter activities like nature and photography walks and owl prowls are also available. 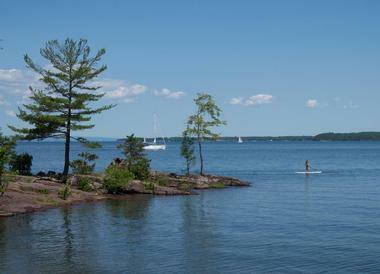 Burton Island is located in the ‘Inland Sea’ of Lake Champlain; it is a state park made up of over 250 acres that is reachable only by boat via a 10-minute ferry ride from Kamp Kill Kare State Park. There are tent sites, lean-to sites, and cabins for guests on overnight stays as well as an array of island activities. With 3 miles of shoreline, water activities like row-boating, canoeing, kayaking, and swimming are abundant. Several hiking trails, a nature center/museum, and park interpreter activities are also available. Interpreter activities led by park staff include night hikes, campfire programs, and nature games. The Lake Champlain Islands are a collection of isles on the sixth biggest lake in the United States. They offer a world of water activities all year round with 200 miles of shoreline offering everything from swimming and sailing to ice fishing and snowmobiling. These islands are ideal for visitors looking for a slower pace, culture, rich history, and scenic views. Guests can travel the Lake Champlain Byway to access the 30-mile-long isles, and have the chance partake in various themed activities such as Chews & Brews. Each of the islands offers its own unique attributes, such as South Hero, which features Vermont’s first vineyard. The Creamery Covered Bridge is an 80-foot-long bridge built of spruce lumber in 1879, and it is one of the few historic features remaining in Brattleboro, Vermont. 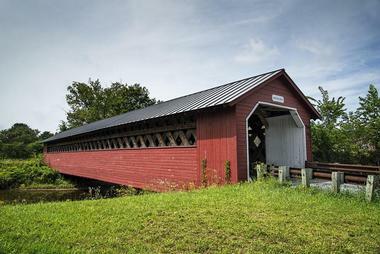 A huge scenic draw that brings in thousands of annual visitors, it is the only covered bridge that can be viewed from Route 9. The bridge remains a functional tool along the east-west route of southern Vermont, allowing guests to travel to the southern end of Brattleboro from west of the city. 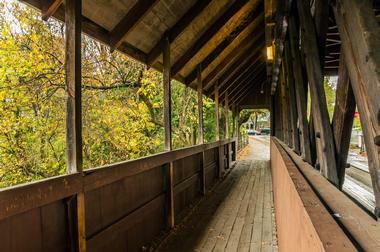 This remarkable wooden covered bridge is essential to preserving Brattleboro’s roots; a region that has quickly becoming devoid of man-made historical features.